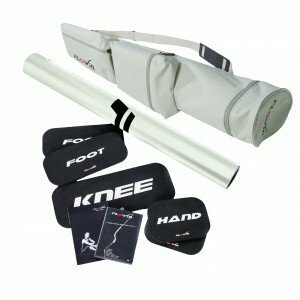 Foldable and shipped with a travel carry bag including five pads (knee, hand, and foot), a manual on training exercises as well as a complete dvd with three differenttraining programs FLOWIN® Sport contains 1 x foldable plate, 140 x 100 cm 1 x instructional DVD 1 x manual 2 x foot pads 2 x hand pads 1 x knee pad 1 x travel carry bag FLOWIN® Sport should only be used on even, horizontal surfaces. Preferably hard floors. Check out all of our premium quality products offered in amazon by sports and prevention and SUXESS, we have a complete line of fitness products. If you have any questions about this product by Flowin Sport, contact us by completing and submitting the form below. If you are looking for a specif part number, please include it with your message.